Aerial lifts come in many types and sizes, most of which are big and heavy. Yet, aside from size and weight, many factors can affect their safety level. When workers aren’t properly trained to operate an aerial lift, accidents are likely to occur. Some of these can cause major injuries. Others can lead to the death of one or more workers. Accidents are common with boom lifts and scissor lifts. Boom lifts produce some of the highest aerial lift accidents due to their height and horizontal reach. Scissor lift accidents are often caused by driving and working on uneven ground. They can also occur during severe weather, often in the form of worker falls and tip-overs. Electrocutions occur when workers make contact with overhead power lines. They can also happen when the lift makes contact with a power line. Telescopic booms have the highest risk of electrical accidents. This is because they are often used to service electrical systems. But that’s not all who are at risk. Aerial and scissor lift training is a key factor in avoiding fatal shocks from power lines. It teaches workers how to assess the work area for overhead live wires and other hazards. Workers also learn how to avoid the wires, and which tools and equipment are best for helping to avoid accidents. These include rubber sole boots, rubber gloves, fall protection systems, and more. 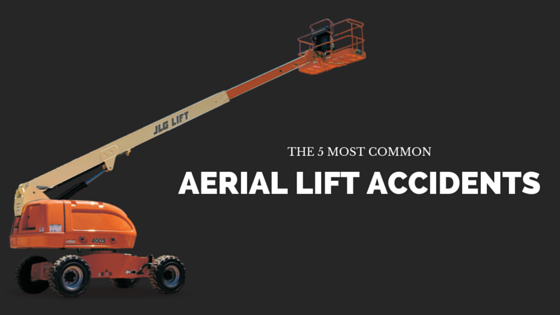 Falls from aerial and boom lifts are common due to the height in which operators work. Scissor lift falls often happen when the lift is used on uneven ground or during rough weather. Either of these can cause the lift to become unstable and lead to a fall. Fall protection is not required when working with scissor lifts. This means workers may not be wearing a harness attached to a lanyard if the scissor lift becomes unstable. Scissor lift tip-overs and worker falls are often caused by objects coming into contact with the lift. Falls from scissor lifts can be prevented with OSHA-approved scissor lift safety training. This training can help prevent aerial and scissor lift tip-overs. It can also reduce the number of accidents on your worksite. Scissor lift tip-overs are often due to operating in poor weather. For example, high winds can easily cause the lift to sway and fall over. Some tip-overs can result from using the lift on uneven ground with slopes or potholes. Using the lift too close to moving objects, such as motor vehicles, can also lead to accidents. One of the main causes for aerial lift tip-overs is boom lift on uneven ground usage. Scissor lifts only go straight up, which makes them less risky than boom lifts. Boom lifts can move vertically and horizontally. As a result, they tend to be less stable when the boom is in the air. A boom lift on uneven ground becomes even less stable, making it more prone to tip-overs and worker falls. The right kind of scissor and aerial lift training can help avoid tip-over accidents. Proper training will teach workers how to assess the work site for hazards that can create unsafe working conditions. Training can prevent scissor lift tip-over accidents – one of the most common causes of scissor-lift injuries and deaths. Worker injury due to contact with objects outside the boom is a fairly common event. This type of manlift accident tends to occur when the bucket is being moved. A worker gets caught between the edge of the bucket and another object, and injury occurs. The object could be a roof joist, a beam, or something else that gets in the way. Before starting work on the lift, workers should check the job site for hazards. Then they should inspect the equipment to make sure there are no loose parts. If there are rotating or moving parts, make sure they are properly guarded. Also, be sure to avoid wearing loose clothing. Workers on the ground should remain at a safe distance from the load. Staying out of the loading area can prevent being involved in boom lift accidents. Scissor lift operators can avoid “caught in between” accidents by staying clear of overhead hazards. These hazards can include power lines, pipes and ceilings. Scissor lifts are also used indoors for many types of jobs. This makes them one of the top causes of injuries and deaths for scissor lift operators. On-foot workers can get crushed when a scissor lift falls over. They should always keep a safe distance from the work area, even more so if the scissor lift is used outdoors on uneven ground. Aerial lift certification with a company like CertifyMeOnline.net prepares workers to recognize and prevent boom lift accidents. Workers learn the dangers of getting caught between the lift and an object. They also learn how those accidents can be avoided. Scissor lift training teaches workers how to avoid getting crushed by the lift or overhead objects. Collapsing materials injure and kill workers every year. This type of accident occurs when workers aren’t aware of their surroundings and make contact with objects that come loose. All workers should be informed of any unfinished building materials on a job site. That way they can avoid risky structures or areas. Scissor lifts are used for many types of indoor maintenance work. Workers should take care to prevent materials from coming loose and hitting people on the platform or on the ground. Large or heavy falling materials can also cause scissor lift tip-overs. That’s why teaching scissor lift safety techniques when working is so important. Aerial lift certification and scissor lift training from a company like CertifyMeOnline.net teaches workers how to recognize and prevent boom lift accidents. Students learn what causes accidents that involve workers getting caught between the lift and an object. More important, they also learn how to avoid them. How Can Training Help Prevent Scissor Lift Accidents? The most common cause of accidents for aerial, boom, and scissor lifts is operator error. The operator makes a mistake, uses a wrong technique, or doesn’t notice a hazard. Sometimes, the accident results from being inattentive or careless. Workers who receive this training are more able to avoid injuries, including fatal ones. They can also help prevent manlift-tip over accidents and fatal falls from happening in the first place. If you’re an aerial, boom, or scissor lift worker and want to know how to avoid manlift accidents, check out CertifyMeOnline.net. We offer an online training program that only takes about one hour to complete. It’s 100% compliant with OSHA standards, and only costs $75. Workers will feel ready to operate any one of these types of lifts, and will have the OSHA-compliant certification to prove it. Real-time training from CMO is the ideal solution for avoiding injuries while working on an aerial lift. It has a 100% OSHA approval rating. It also comes with free lifetime renewal training. Keep your team safe from aerial lift falls and tip-overs. Create an account and receive your aerial and scissor lift certification today! This entry was posted in Aerial Lift Training on May 12, 2016 by admin.